Pier Giorgio Di Cicco was born in Arezzo, Italy in 1949 and emigrated to Montreal in 1952 with his parents. The family lived for a time in Baltimore where Di Cicco’s father died, and then in 1968 they moved to Toronto. He earned a B.A. in English (1973) and a B.Ed. (1976) from the University of Toronto. By this time Di Cicco was writing and publishing poetry in literary magazines and was featured in Al Purdy’s Storm Warning II (1976). His first book of poems, We are the Light Turning appeared in 1975 and in a revised edition in 1976. He was an editor with Books In Canada and later with Waves, Descant and Poetry Toronto. 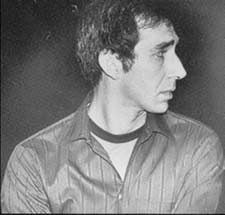 Di Cicco produced four other books of his poems and then edited the first anthology of Italian-Canadian poetry, Roman Candles (1978) making him the founding father of Italian-Canadian writing. He had the insight to understand that there were a number of young writers exploring the experiences of Italian immigrants in Canada. This soon flourished into a literary movement with over 100 writers publishing in English, in French and in Italian and resulted in the founding of the Association of Italian-Canadian Writers in 1986 during a conference Di Cicco attended. For Pier Giorgio Di Cicco, his next important book was The Tough Romance (1979), which was reprinted by Guernica Editions (1990) and also translated into French as Les Amours difficiles (1990). In his later books, Flying Deeper into the Century (1982) and Post-Sixties Nocturne (1985), Di Cicco demonstrates the influence of Italian and Latin American writers to produce a surreal verse in opposition to Canadian deconstructivism and colonial traditions. This style of deep images also includes a strong dimension of philosophical abstraction in Virgin Science: Hunting Holistic Paradigms (1986). His poetry has been included in many anthologies in Canada and other countries. Di Cicco became an Augustinian Brother in 1984 and removed himself, for over a decade, from the world of letters. He was ordained into the Roman Catholic Priesthood and received a Master of Divinity degree in 1990. He returned to the world of literature in the 21st century, rapidly publishing five books of poetry: Living in Paradise (2001), The Honeymoon Wilderness (2002), The Dark Time of Angels (2003), Dead Men of the Fifties (2004) and The Visible World (2006). His latest work is a non-fiction book on urban aesthetics and sustainable planning – Municipal Mind: Manifestos for the Creative City (2007). He served as Toronto’s second Poet Laureate between 2004 and 2007.